For at least a couple of years, I’ve wanted to try my hand at making crackers. I’ve seen them posted by Deb at Smitten Kitchen and watched both Alton and Ina make them on FoodNetwork and finally decided to take the plunge and make them a few weeks ago when we hosted dinner for my parents and Kyle’s mom. My first choice was Deb’s recipe but couldn’t find spelt flour so since I’ve been drooling over another of Ina’s recipes since last summer, I thought this would be the natural choice. The recipe takes no more effort than putting together a cookie recipe and uses the same technique as slice-and-bake sugar cookie where you roll the dough into a log, wrap it in plastic wrap and chill it for a few hours or a few days until you’re ready to bake the crackers. I should note here that the dough was a little on the crumbly side so I did need to add some extra water to help it come together. No big deal though. These crackers turned out just as I had hoped they would: bursting with herby and cheesy flavor with a nice substantial feel to them. 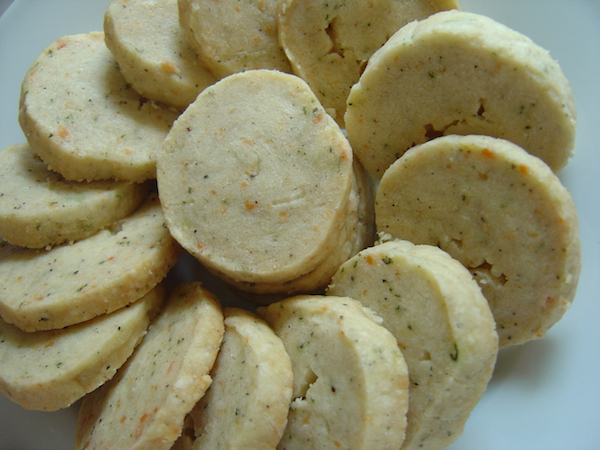 Just as Ina described them, they were similar to that of a savory shortbread cookie and can be munched on by themselves without the need for cheese. We all adored these little babies and I will definitely make them again. In the bowl of an electric mixer fitted with the paddle attachment, cream the butter for 1 minutes. With the mixer on low speed, add the Parmesan, thyme, salt, and pepper and combine. With the mixer still on low, add the flour and combine until the mixture is in large crumbles, about 1 minute. If the dough is too dry, add 1 tsp water. Dump the dough on a floured board, press it into a ball, and roll into a 9″ log. Wrap in plastic and refrigerate for at least 30 minutes or for up to 4 days. You can freeze the dough for up to 6 months. Defrost overnight in the refrigerator and then slice and bake when you’re ready. Meanwhile, preheat the oven to 350 degrees F. Cut the log into 3/8″ thick rounds with a small, sharp knife and place them on a sheet pan lined with parchment paper. Bake for 22 minutes, until very lightly browned. Rotate the pan once during baking. Cool and serve at room temperature. Yum! These would make a great snack.